Disposable/plastic bags damage our environment! Have environmental awareness and start using our Reusable Grocery Bags to minimize the usage of plastic bags. 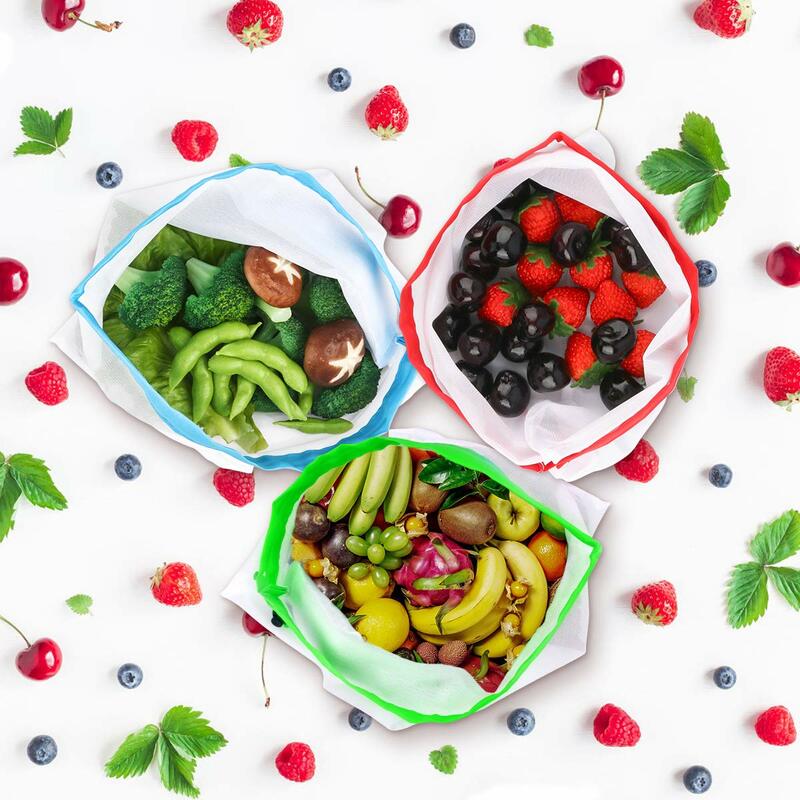 Environmentally friendly, these bags are breathable and washable, preventing sweat inside and ensuring the freshness of your fruits and vegetables for a longer time. Clean up the Planet one bag at a time! SAFE: 100% food contact safe, our bags are BPA, Lead, and Mercury Free, and made in a facility free from harmful manufacturing chemicals with the highest standards of quality. BREATHABLE & WASHABLE: Breathable mesh design instead of sweating inside the store's plastic bags.Washable and reusable for grocery and storage. REUSABLE TO SAVE THE ENVIRONMENT: More important than saving money, by using our reusable grocery bags, you can reduce hundreds of plastic bags every year. Packaged in an environmentally friendly way - using a reusable polyester drawstring pouch instead of a plastic bag. DURABLE: Made of strong, lightweight, easy-to-see-through mesh polyester and reinforced with bias tape which makes them hold heavy loads safely and last for long time use. CONVENIENCE: Drawstring and pop lock for convenient opening and closing. Easily Portable, Trouble Free and Hassle Free when bringing these along on your next shopping trip. You can wash fruits and vegetables directly in these bags and then place them straight into the fridge. MULTI-FUNCTIONAL: Transparent storage for travel items and almost any household item. Perfect for toys, fruit, vegetables, coins, medicine, cables, cosmetics, accessories and much more. Use them to keep things together during grocery shopping, camping, fishing, garden harvest, beach, travels, etc. The bags are excellent. Really functional. The mesh is dense. No foreign smell. I use them for storing vegetables and fruits, dry greens and herbs, freezing berries, washing delicate things, storing children's designer, puzzles and lego. very good product - exactly as described - fast shipping - totally recommend this seller, thank you!!! big and nice bags, thank you seller, I recommend it! Description corresponds to reality, nice and comfortable mesh, quality is good. Bags as in the photo, came ~ 2 weeks. I liked the quality, thanks to the seller! Good quality, they came well, good presentation i loved. will buy more! I like them a lot. They look tough. For the price you have don fantasticas! Performance is good. It was only necessary to pay the tips of the laces. The size of the blue packages was large, it would be better to put more red. I wasn't sure about it but iam glad I bought it. Very good quality. I don't like plastic bags. I will buy more. Corresponds to the description, the quality is normal, took for the pool, very convenient.